ShoeDazzle is a monthly shoe, clothing, and accessories subscription service. You can shop their merchandise like normal retail, but they have a VIP subscription that gives you better prices – almost everything is only $39.95 (or less) for VIPs. When you sign up for a membership, you complete a style profile. On the 1st of every month, they release new styles and you can pick any item you want – either from your personal ‘Showroom’ or across the site. You can also skip the month. However, if you don’t pick or skip, you get charged $39.95 store credit to spend any time. 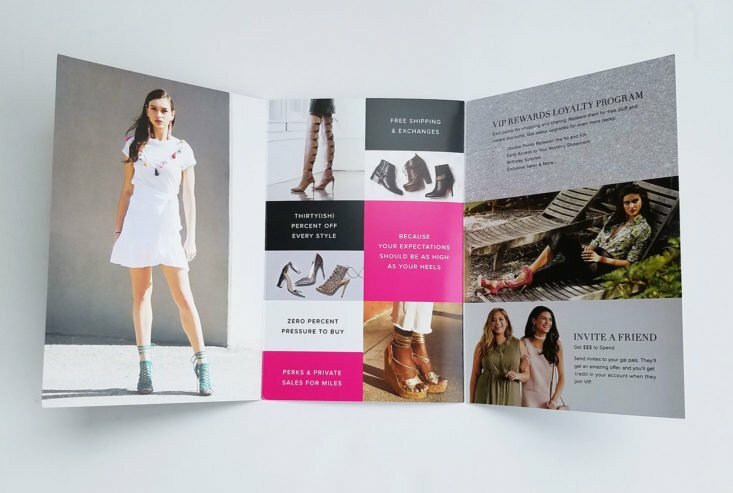 This model is similar to how JustFab, Fabletics, and AdoreMe work. COUPON: Get your first style for $10! No code need, just use this link! Check out all of our ShoeDazzle reviews and the top ShoeDazzle picks each month! 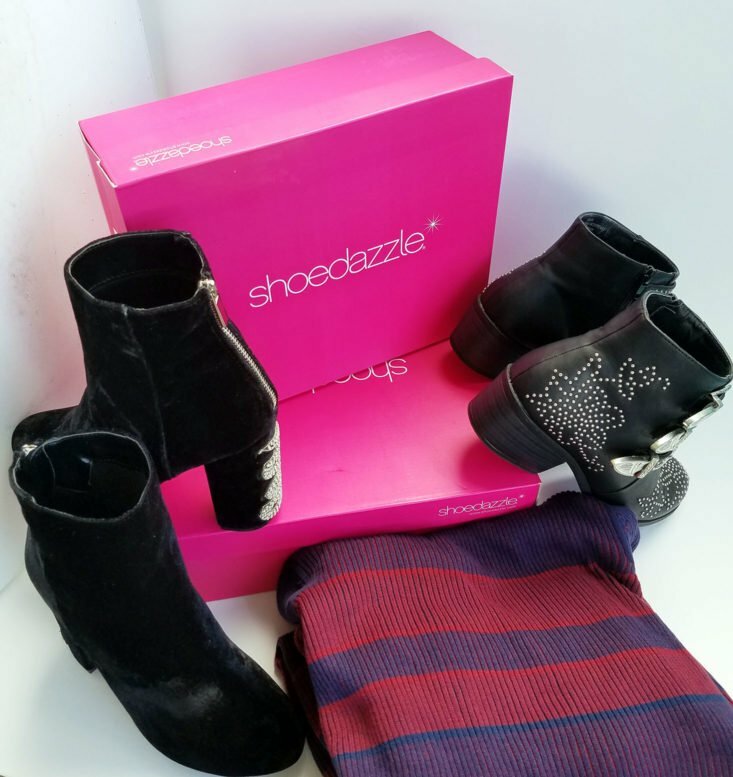 This is my first ShoeDazzle box! I opted to partake in the introductory two pairs for $39.99 (it was far too irresistible not to) and also selected a sweater dress on a separate order. My first order came with a basic invoice along with ShoeDazzle’s return and exchange policy. They included this incredible discount code for Nakedwines.com. I have never used this service, but with the holidays right around the corner, this would be ideal for gifts and parties! ShoeDazzle included this $30 coupon for Blue Apron as well. 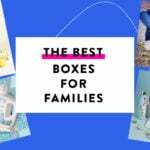 I am tempted to try out this meal kit! Finally, they sent me a little booklet to welcome me as a VIP. The booklet is part look-book and part pamphlet that has useful information on their VIP program and policies. I think I had heart emojis in my eyes when I first saw these shoes; I put them in my cart without any hesitation. I usually wear flats and oxfords, but recently I bought a pair of Bad Sandy heels (as seen here) and have since been more open. I will never be able to walk in stilettos, but thick block heels and platforms are do-able. These shoes make me think of Cher in the infamous “Turn Back Time” video (you know which one I am talking about) due to the tough, yet fancy rhinestone snake detail on these gorgeous black velvet booties. Sadly, I could not get my feet into these dreamy boots. I momentarily forgot that I have a high instep and wide Barney Rubble feet. To no avail I tried stuffing my feet into these like one of Al Bundy’s anguished customers on Married with Children; but these booties weren’t in the cards for me, sadly. There is a silver lining, though: ShoeDazzle has a great exchange policy/free returns and I have four back up choices to select from! Hallelujah! I am a sucker for western/biker style accessories and pieces. I always have been drawn to them; probably due to my mom’s dad. He was always in western wear and I have a few of his old cowboy style shirts in my wardrobe. Much like the Mackie boots, I fell in love with this pair immediately, but unlike them— THESE FIT! I am really impressed with how well these boots are made, especially for the price. I have seen similar styles with multiple buckles and stud details go for far more elsewhere. I am also amazed by how comfortable these booties are. They fit my wide ankles just right. I sense I will be living in these boots all Fall! What is more Fall than a sweater? Answer: a turtleneck sweater dress, that is! The ribbed, lightweight fabric is great for cooler Fall weather, but not too bulky for layering in your favorite denim or leather biker jacket. The turtleneck pairs well with longer necklaces, so I paired this dress with this lovely piece from my last review for Jewelry Subscription box. I love the sassy little slit on the side of this dress also. It makes me feel like Jessica Rabbit if she was going on a casual date to an orchard to pick apples. Once it gets chillier, this dress can be paired with tights and a knit hat as well. I foresee myself wearing this for my family’s Thanksgiving dinner. Verdict: I think I am in love with ShoeDazzle! Guys, it is a little out of control. I just joined and have been sending endless texts to my friends to persuade them to join as well. I even caught myself singing Shoe Dazzle’s praise in the lunch line at work and at a drag show a few weeks ago. I have ShoeDazzle on the brain! I am so impressed with their selections, quality, and price points that I feel compelled to share the love on a constant. The introductory deal of $39.99 for two pairs of shoes is just too enticing to pass up! The VIP prices even after that initial deal are reasonable. My only gripe is that I wish they had a more extensive selection of plus size clothing, but I am still pleased with the offerings they do have. Did I mention they carry WIDE CALF BOOTS?! I mean, that is music to any bodacious babe’s ears. When I say I’m in love with Shoe azzle, you best believe I’m in love, L-U-V! What did you get from ShoeDazzle that you love? Nicole Rieder is a self-proclaimed clothing fiend and is new to the subscription box world. She loves boxes like Gwynnie Bee because she can play around with styles she may not have before! How do subscribers rate ShoeDazzle? Do you subscribe to ShoeDazzle? Add your rating now! Hey Nicole, you said in the review they have free shipping for exchanges? Cuz I have really wide feet and I’m worried the wide width shoe selection might not be wide enough for me. But if they will exchange them at no cost I would be way more inclined to sign up! So I’m just making sure I understood you correctly. Thanks! And love your reviews. I read every one of your reviews. I love your peppy, happy and straight forward attitude! Hello Ashley! Sorry about the delay. They do offer free returns! All you do is print up the free label and take it to USPS. They do take a fee out if you want a refund to your bank account, but I just had them put mine as a credit on my account because I know I will spend it! hahaha. I hope that helps! And thank you so much for reading all my reviews! That means so much to me! When you subscribe do you get access to shoes and clothes?!!! Yes! It is awesome. You can peruse their site and pay the full price or join as a vip and get a discount. Each month $39.99 is taken from the bank or credit card account you link, but you have the option of skipping too. But each month they add new styles and items to chose from and you can use that $39.99 towards your order. I guess they also have sales now and then too and notify you. There was a big Labor Day sale I missed, but I am sure there will be one closer to the holidays too! Plus your first item is super discounted. Like first pair of shoes is $10 plus shipping or two pairs for $39.99 with free shipping! You can get a clothing item instead and it is super discounted too! I feel you on that. Well, you can also do the first month and get TWO pairs for $39.99! It is such a deal! You can skip or cancel anytime after that too! YES! Great minds think alike! 🙂 You just can’t go wrong with the New York Dolls, am I right or what? I’ve been obsessing over those studded boots thanks to you Nicole and I finally ordered them — in black AND navy VELVET! I haven’t been this excited about a shoe purchase in ages. Now fingers crossed they fit! AmyM, I am so excited for you! I was eyeing up the blue ones too because they are so dang cute! I hope they fit you amazingly! Thank you, Carey! I will try to select a pair to test them out to review. I always have a hard time as well. It is brutal! "Ad of right now, the box has been removed from the site. 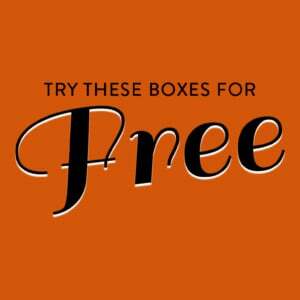 :("
Best of Dermstore Box – Back in Stock! "There's actually a cancel option in the My Account section. At least there was on mine." "Thanks for the laugh this morning! Also, same 😂"